In the first and second parts of this article series, we explained the requirements before you can use the Create Cluster wizard in the VMM. In the third part, I’m going to walk you through the process of creating a Hyper-V cluster between two Hyper-V hosts via VMM console. 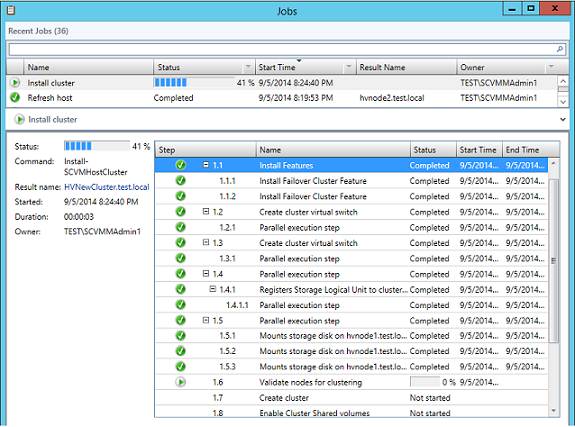 The process of creating a Hyper-V Failover cluster via VMM is very simple. The VMM reduces the time it takes to perform the same set of steps manually. As a manual process, you need to perform several steps, including preparing the shared storage, installing Windows Failover Cluster feature on all nodes, etc. VMM can perform all the required steps automatically on the Hyper-V nodes which are going to be part of the Hyper-V cluster. 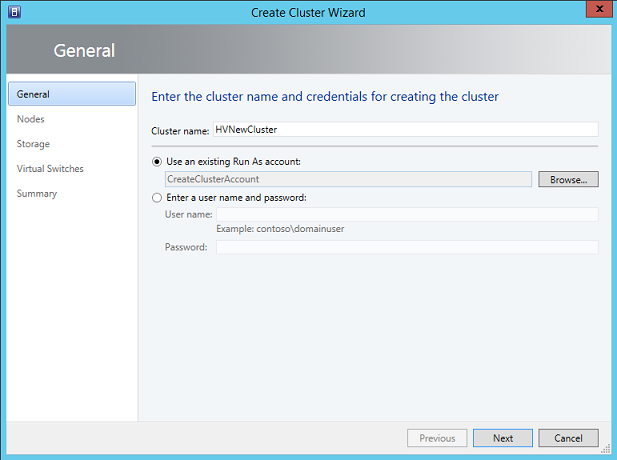 Clicking on the “Hyper-V Cluster” button will bring “Create Cluster Wizard” window as shown in the screenshot below. 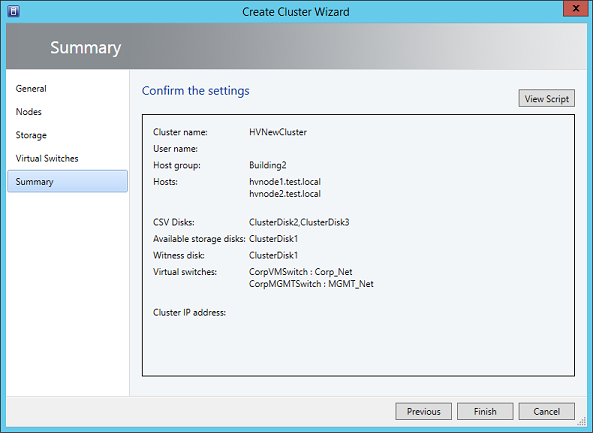 The wizard helps you build a Hyper-V cluster with minimal steps. All you need to do is to provide the required information throughout the wizard. In the General Tab, you need to provide the cluster name and the credentials. The credentials will be used by the VMM Server to access all Hyper-V nodes and perform the required operations such as adding the Failover Cluster feature, masking shared storage, performing cluster validation tests, etc. Click the next button to show you the Nodes page. On the Nodes page, select the Host Group, which contains the Hyper-V nodes that are going to be part of this Hyper-V cluster. It is important to note that you cannot select Hyper-V nodes from different VMM host groups. 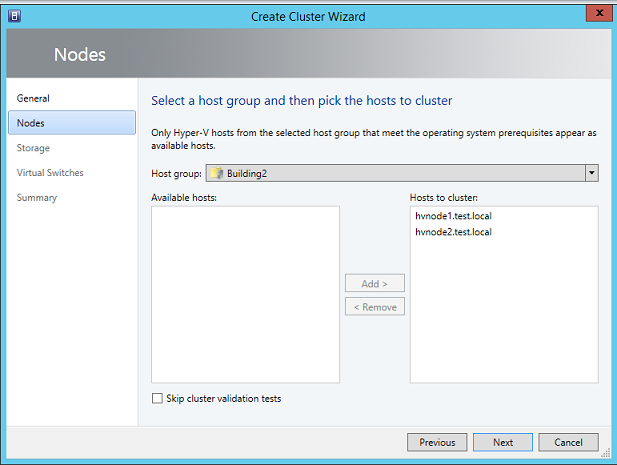 The Hyper-V nodes must reside in a single VMM Host group before you can build the Hyper-V cluster. When you click the Host Group, you will be presented with the list of available Hyper-V nodes in that VMM host group. All you need to do is to select Hyper-V nodes in the "Available hosts" list and then click "Add" button to move the Hyper-V node to "Hosts to Cluster" list. As you can see in the below screenshot, I have moved all of my Hyper-V nodes to "Hosts to Cluster" list. You also have an option to skip the cluster validation tests. If you check "Skip cluster validation tests" checkbox, VMM will not run the cluster validation tests on all nodes, which, in turn, reduces the time it takes to build a Hyper-V cluster via VMM. You can also run the validation tests using the Failover Cluster Manager at a later point of time. Clicking next will show you the IP Address page. If you are using static IP configuration on each Hyper-V host, please make sure that at least one physical network adapter on all Hyper-V hosts belong to the same IP subnet. The physical network adapters must also be configured with a default gateway for the IP Address page to appear during the cluster creation. 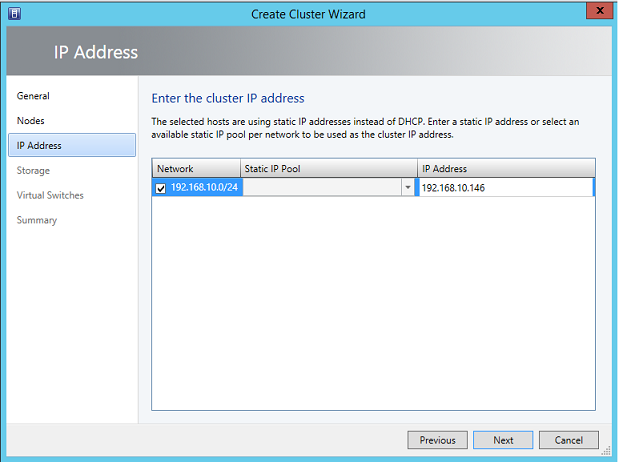 If you have configured Hyper-V hosts to obtain IP configuration from a DHCP Server, the Create Cluster Wizard will not provide you an opportunity to assign an IP address for the cluster. To put in other words, the IP Address page will not be shown. Since Windows Server 2012 and later Operating Systems support assigning a cluster IP Address from a DHCP server, the cluster creation wizard will automatically select an available IP Address from the DHCP Server rather than showing you the IP Address page. Click next to select the shared storage disks. At the Storage page, you can select the disks you want to make available to the Hyper-V cluster. There are two types of disks you need to select for a Hyper-V cluster to work properly; Witness Disk and Cluster Data disk. Witness Disk: It is important to note that Create Cluster Wizard selects a disk as a Witness Disk automatically. As you can see in the screenshot below, the wizard automatically selects ClusterDisk1 as the Witness Disk. If the number of cluster nodes is even, the wizard automatically selects the disk that is larger than 500 MB. You cannot uncheck the disk which is selected automatically by the wizard. Custer Data Disk: Cluster Data disk is required for storing the virtual machine files such as XML and VHD/VHDX files. 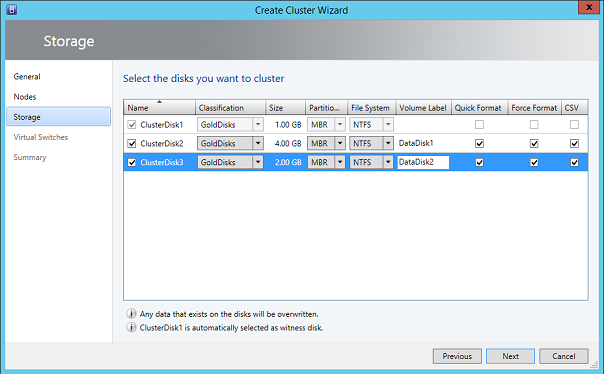 The Create Cluster Wizard will show you the available cluster disks. It is important to understand that the wizard can only detect disks which are not assigned to any of the Hyper-V hosts in the VMM. You have several options to check for Cluster Data Disks such as specifying the volume label, formatting the Disks, assigning disks to the CSV, etc. Select the cluster data disks and then click Next button. The next configuration page in the Create Cluster Wizard allows you to select the logical networks for creating the external virtual switches on destination Hyper-V nodes. 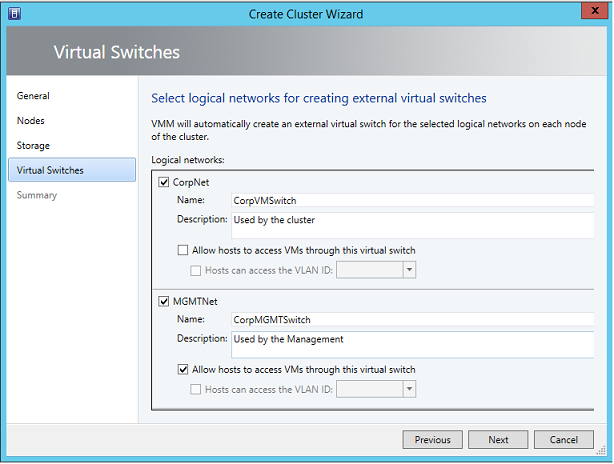 VMM will automatically create the virtual switches on all the Hyper-V nodes. It is not necessary to have virtual switches created during the Create Cluster Wizard. You can also create the virtual switches on each Hyper-V host at a later point of time, but creating the virtual switches via VMM keeps the configuration consistent and identical. You might not see the Virtual Switches configuration page during the Create Cluster Wizard if physical network adapters of Hyper-V nodes are not assigned to a VM Network. You can verify that on the property of each Hyper-V node. Once you have specified all the required information, you are presented with the summary. You can verify all the information here before you hit the Finish button. At this stage, VMM starts building the Hyper-V cluster by executing the several PowerShell jobs in the background. You can see the progress of all jobs in the VMM Jobs window. As you can see in the VMM Jobs window above, VMM runs several jobs and shows you the status of each job in the Jobs window. VMM Installs the Failover Clustering feature if it is not installed on each Hyper-V node. It validates all hosts to ensure they meet the prerequisites, such as required operating system and domain membership. VMM masks and unmasks the selected shared storage disk to each Hyper-V node. It also runs the cluster validation tests if you had selected to do so and so on. There are a few requirements which you need to meet before you can build a Hyper-V cluster via VMM. We explained the various requirements in Part 1 and Part 2 of this article series before starting the Create Cluster Wizard. 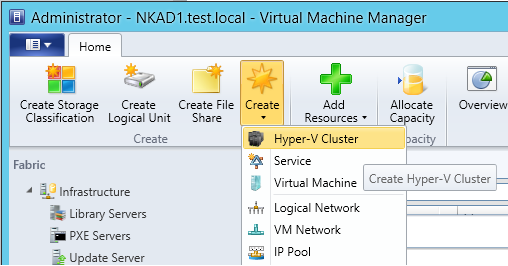 The third part of this article series walked you through the process of creating a Hyper-V cluster via VMM. Once the Hyper-V cluster is created, it will be managed by the VMM. Since the whole purpose of building a Hyper-V cluster is to make virtual workloads highly available. In the final part of this article series, I will walk you through the process of making a virtual machine highly available in the Hyper-V cluster we just created.